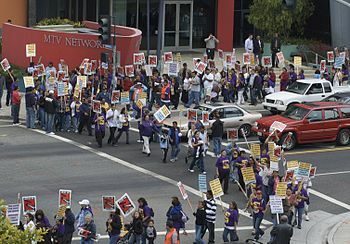 Janitorial workers exercising their right to protest in front of the MTV building in Santa Monica, California. The right to protest is a human right arising out of a number of recognized human rights. While no human rights instrument or national constitution grants the absolute right to protest, such a right to protest may be a manifestation of the right to freedom of assembly, the right to freedom of association, and the right to freedom of speech.Additionally, protest and restrictions on protest have lasted as long as governments have. Many international treaties contain clear articulations of the right to protest and it is crucial for individuals who are interested in protesting to stay up to date and aware. Such agreements include the 1950 European Convention on Human Rights, especially Articles 9 to 11; and the 1966 International Covenant on Civil and Political Rights, especially Articles 18 to 22. Articles 9 enunciates the "right to freedom of thought, conscience, and religion." Article 10 enunciates the "right to freedom of expression." Article 11 enunciates the "right to freedom of association with others, including the right to form and to join trade unions for the protection of his interests." However, in these and other agreements the rights of freedom of assembly, freedom of association, and freedom of speech are subject to certain limitations. For example, the International Covenant on Civil and Political Rights contains prohibitions on "propaganda of war" and advocacy of "national, racial or religious hatred"; and it allows the restriction of the freedom to assembly if it is necessary "in a democratic society in the interests of national security or public safety, public order, the protection of public health or morals or the protection of the rights and freedoms of others." (Articles 20 and 21) It is important for people interested in protest to note that different places have passed their own clarification of these rights. Protesting, however, is not necessarily violent or a threat to the interests of national security or public safety. Nor is it necessarily civil disobedience, because most protest does not involve violating the laws of the state. Also, since it is an expression of a universal right, choosing to lawfully protest is not a violation of state laws. Protests, even campaigns of nonviolent resistance or civil resistance, can often have the character (in addition to using nonviolent methods) of positively supporting a democratic and constitutional order. This can happen, for example, when such resistance arises in response to a military coup d'état; or in the somewhat similar case of a refusal of the state leadership to surrender office following defeat in an election. During points of widespread tension or controversy within a society, it is important for government institutions to recognize this right. A democracy's ability to preserve its citizen's right to protest is a result of that democracy's "political health." ^ "The Historic Right to Peaceful Protest". YourRights.org.uk (Liberty). 19 September 2006. Archived from the original on 30 April 2008. ^ a b Cooper, Jo (2005). Addis, Megan; Morrow, Penelope (eds.). "The Right to Peaceful Protest" in Your Rights: The Liberty Guide to Human Rights (8 ed.). Pluto Press. ISBN 9780745322766. ^ Adam Roberts, "Civil Resistance to Military Coups", Journal of Peace Research, Oslo, vol. 12, no. 1, 1975, pp. 19-36.